BULAWAYO, Zimbabwe, CMC – West Indies touched down here yesterday afternoon for their two-Test tour against Zimbabwe, as they chase their first series win in three years. The confident Caribbean side arrived on a flight from South Africa, after leaving the Caribbean for London on Monday. 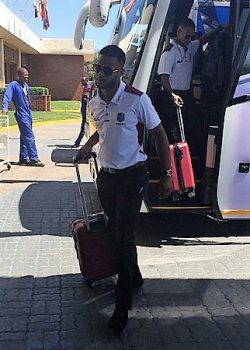 West Indies batsman Shai Hope alights from the bus following the squad’s arrival in Zimbabwe. West Indies will waste little time in getting preparations underway, as they stage their first training session this afternoon. They open the tour with a three-day match against Zimbabwe A starting Sunday at the Bulawayo Athletic Club before taking on the hosts in the opening Test at Queens Sports Club bowling off October 21. The second Test is also scheduled for Queens Sports Club starting October 29. West Indies boast a stellar record against the Zimbabweans, having never lost a Test in eight previous meetings. And though the former World champions have won just three of their last 20 matches, they will be fancied to get the better of the African side, who are without a Test win in six years. However, the hosts have been boosted by the return of Kyle Jarvis and Brendan Taylor who have not represented the country in recent years. A 17-man Zimbabwe squad has been chosen to prepare for the series and are currently in camp here.